Holt5's Artwork - page 2 - traditional and digital artwork - Furtopia | Family Friendly Furry Forum and IRC Chat! Why do I sense a rabbit revolution coming? I will be including other animals eventually, but right now I'm mostly focusing on a handful of characters to get them fleshed out. These ones are actually part of a bigger group, which includes raccoons and otters so far. Nice artwork, good work with the action too. Thank you - glad the motion-capture looks good! 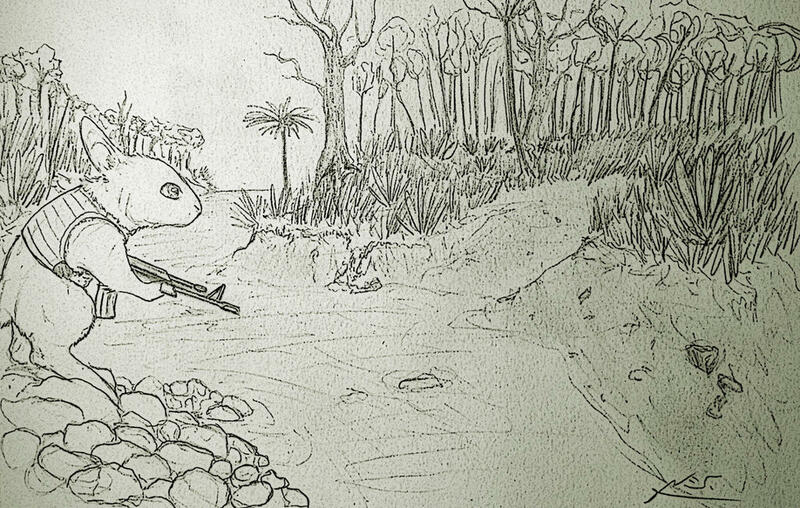 I love those battle-ready rabbits! The Ratchet and Clank picture had some good atmosphere to it, as well. Keep up the good work and thanks for sharing your art with us! Redwall definitely has an old story-book kind of feel to it, at least as I remember it, which was mostly brought out in the original illustrations. That's originally what I set out to emulate when I started drawing animal characters, so it's cool to hear that I'm on the right track. It's a very fun series: a bit repetitive in plot, but lots of interesting characters and battles. It's been years since reading any of them, but I can still attach names and events to each book. They're worth a look! Thanks again, lol - it's a pleasure to chat with you (all)! knights, castles, and swordplay to inspire the imagination of anyone. It's good to see rabbits who can protect themselves. 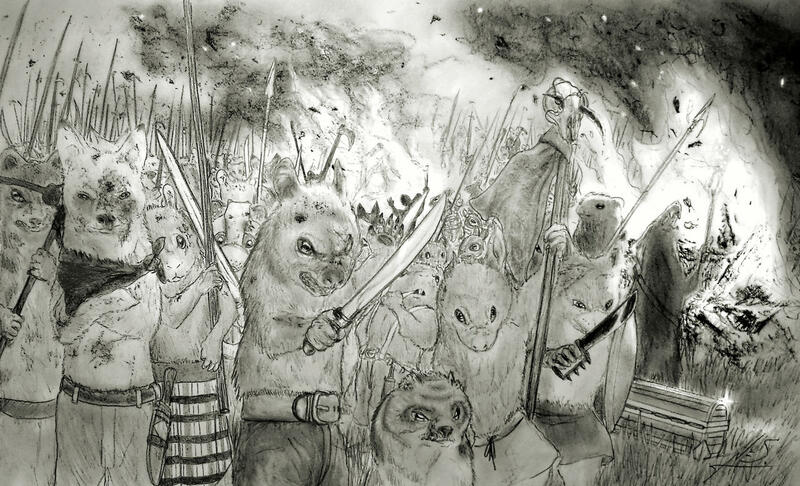 A large horde of vermin - something you'd typically find in the Redwall universe! Drawn in pencil and charcoal. Also got to use my new Tombow micro eraser, which was EXTREMELY helpful in achieving some of the highlights. Good job on the drawing Holt. to give the picture a more realistic look.. I'm starting to feel the same way about it! After looking up some tutorials on more realistic drawings I was able to adapt some of the techniques for newer pictures I've been working on, and it's turning out to be a lot more fun and more involved than anything I've done before. 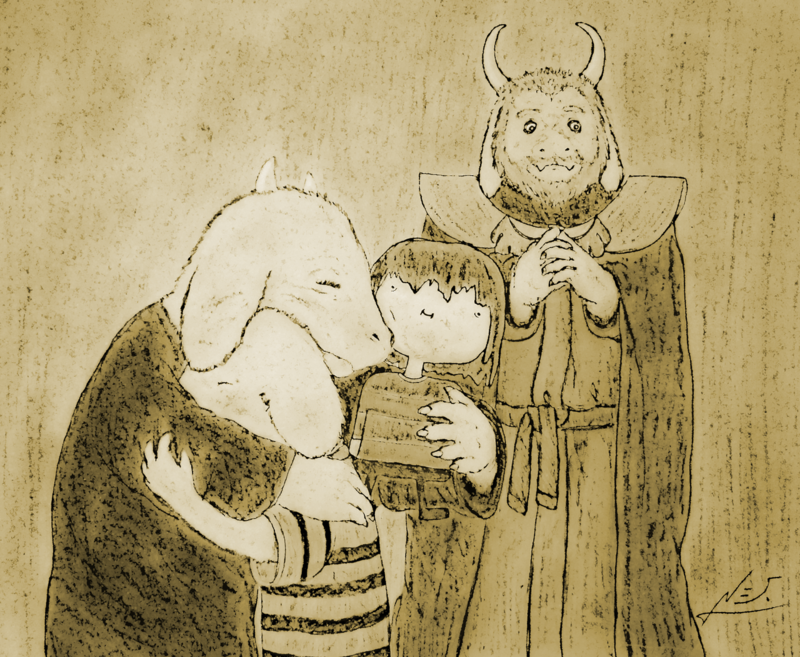 Not sure if there are any Undertale fans here, but this is the most recent from that fanbase. If you haven't played it yet, I highly recommend not looking. Now that should keep them safe from biological attack, or spraying for fleas. I love Redwall art! The one I like best is the one you did with the black/white negative where you did multiple species to show off your range of artistic ability. The rabbit photos holding guns reminds me of some crazy computer CGI short where a bunch of rabbits were fighting with guns in the middle east. I like traditional pen/paper art because that's what I'm most familiar with so I like the sketches because it shows your natural talent with your hands. Keep it up! 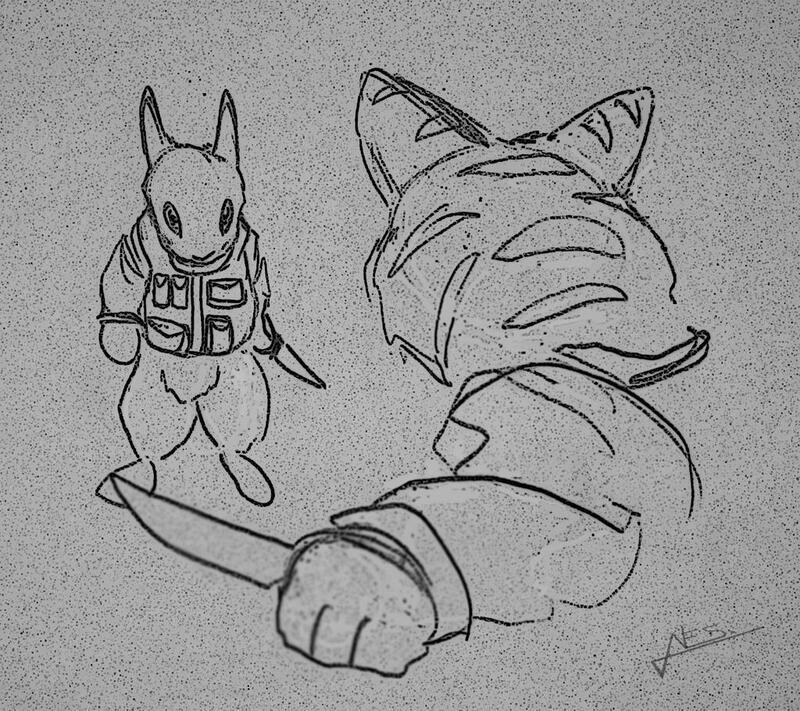 I'm thinking there may be a renewed surge in Redwall art in the coming months/years. There is a team of people working on a Redwall game right now actually - if you haven't heard already. There are a couple other games in development that have very similar concepts too. Glad you like it! I don't do much of the negative style, but I think it's good to jump around and try different ideas: it helps with finding new styles and techniques, and then that leaves lots of different things to mix and match later on. 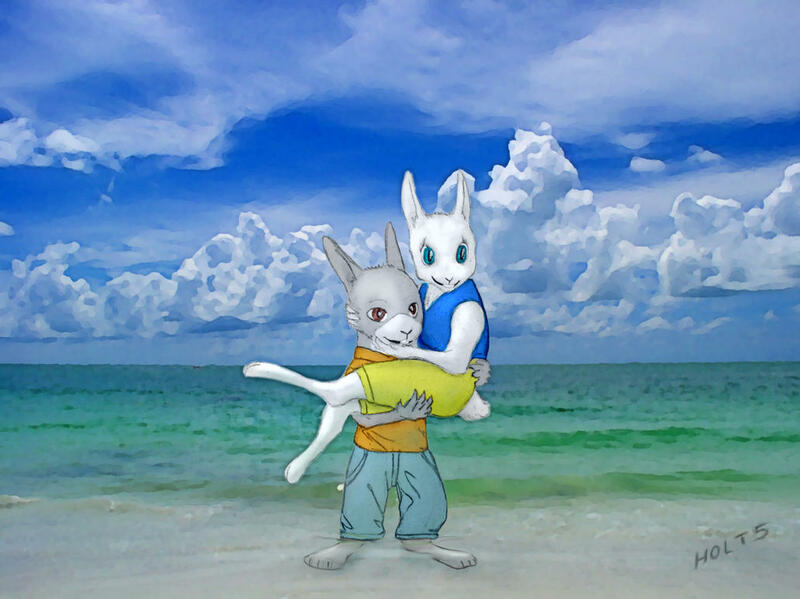 The rabbit pictures are actually based largely on that animation - or rather the comic books that were published before it. xD It's actually one of my favorite shorts just because it is so crazy and different from a regular cartoon - like Redwall mixed with Call of Duty. Traditional is definitely a good area to work in. I enjoy coloring with a computer's help, but trying to draw with one drives me insane, lol. Maybe I'll dabble in colored pencils, pastels, & crayons sometime, but I've never felt like I was good at adding color traditionally. Obviously that means I need to steer in that direction though! Thank you! Monochrome or colored? I'm not sure which one works best... Engagement photo/concept image of two characters in my comic-book-to-be: Rhodes and Lara. 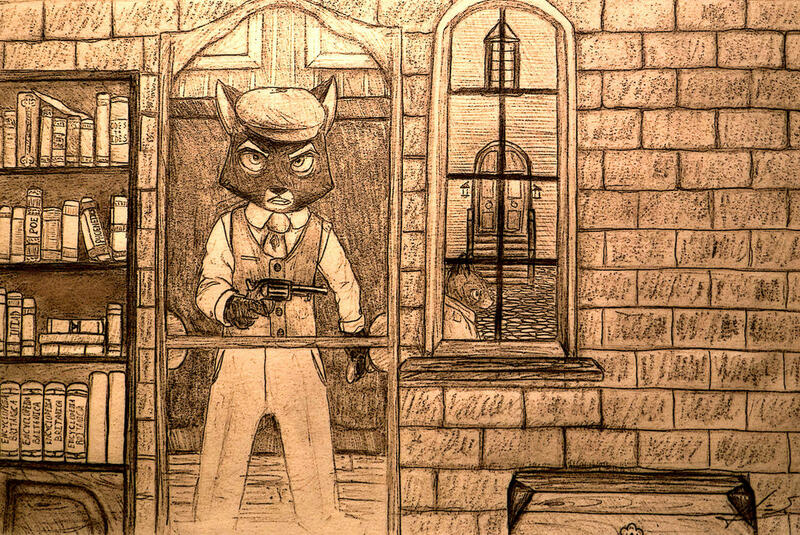 Some Lackadaisy fan art. Young Mordecai. And lastly - Master Korin from Dragonball Z! I like the colored better. Hmmm...tough call. I like the colored a lot, but the monochome version reminds me of wedding photos when couples want a black and white shot or two. I guess it will come down to what works best for you comic book and what doesn't stick out like a sore thumb (one colored picture when the rest aren't, or vice versa). On Redwall, certainly possible we could see more art if that game ever gets off the ground. 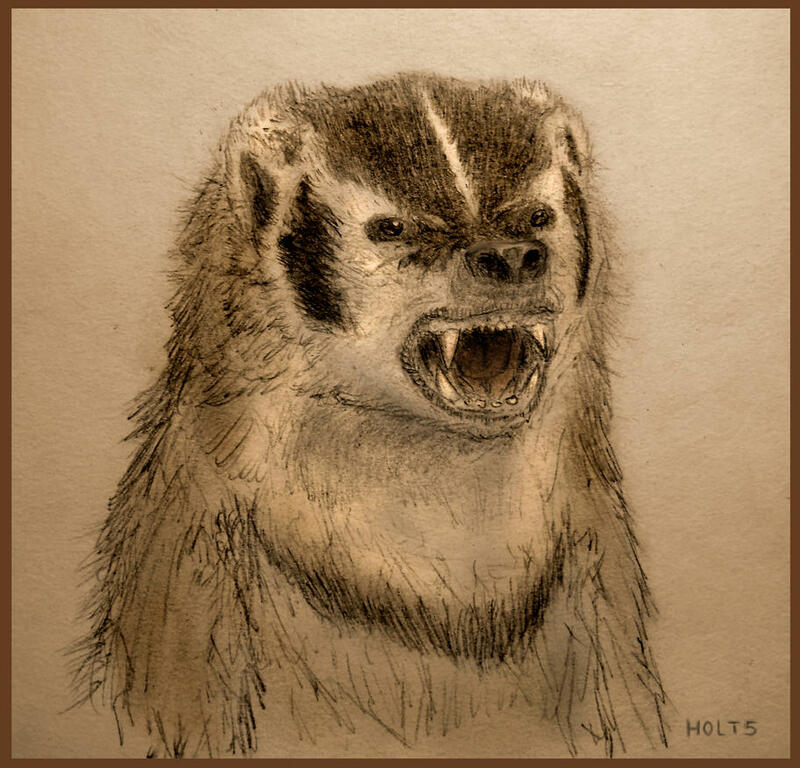 There's a lot of Redwall art already out there though, even before the game was brought to light. It could rekindle a lost fire I suppose when the author died. I was a mod of that official forum when it was all announced so I saw things come and go, but it didn't look like some of the recent stuff was going anywhere. I say ole chap, Jolly good work. 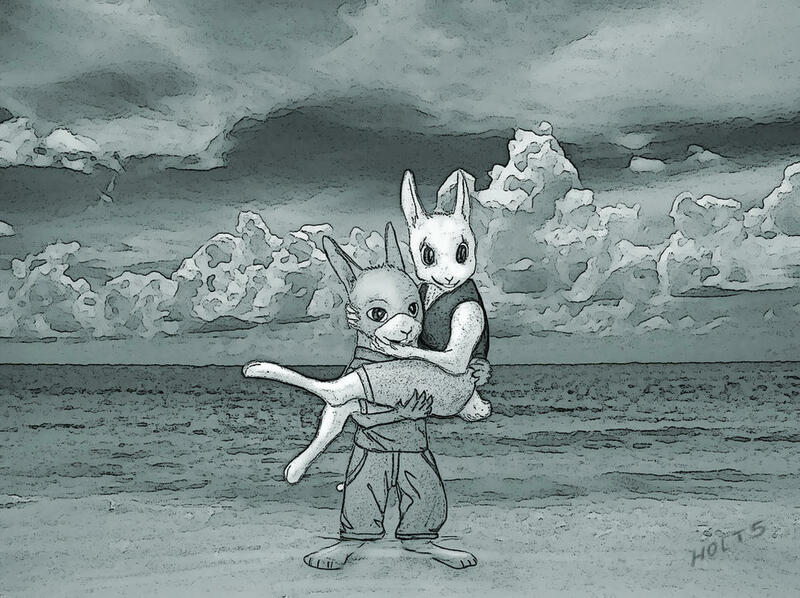 As the Hares of the Redwall stories would say. Hmm, yeah kinda what what I was thinking - different versions would suit different moods or styles. Thanks for the feedback! Oh definitely! I think new Redwall art was just starting to decrease in number when I joined a fangroup for the books, back in 2008 maybe? But it brought out a lot of good stuff in any case. That forum wouldn't happen to have been Redwall Wiki would it? That's basically where I met all of my online friends. I do remember there were a few attempts at making a Redwall game while Jacques was still alive, but most of them appeared to be hoaxes. 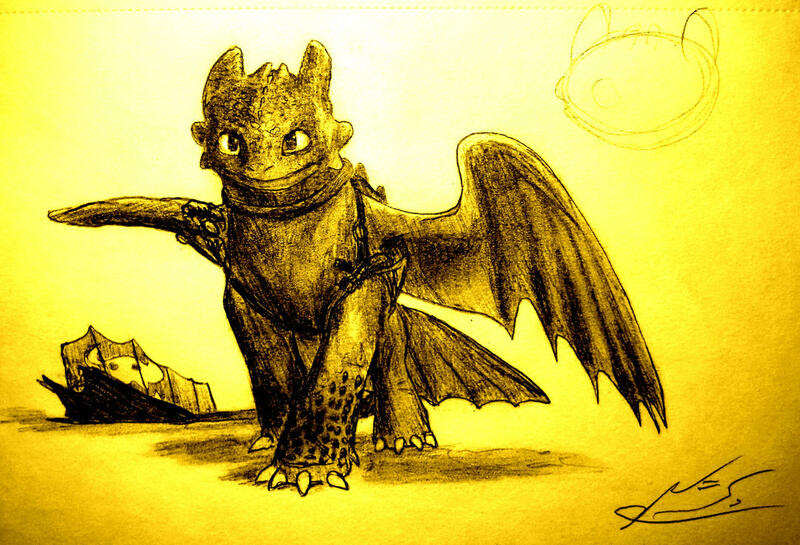 Here's some Toothless the Nightfury. There is a creature who would give you a chill if not expected. That drawing turned out nice. Thank you very much, Old Rabbit! creatures. Not afraid to use tooth and claw. This is a request from Wildhead for a story he's working on. 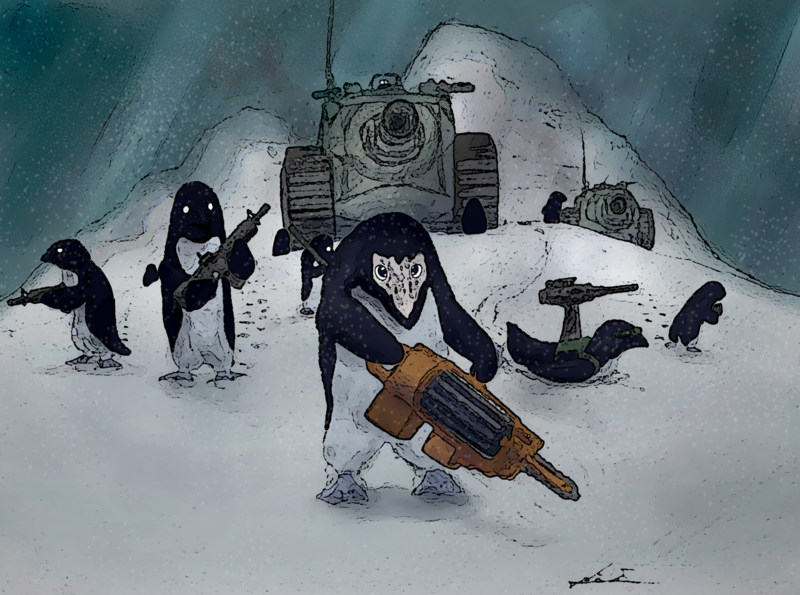 Also a gift-art for Peter the PTSD Awareness Penguin, which can be found on Facebook.